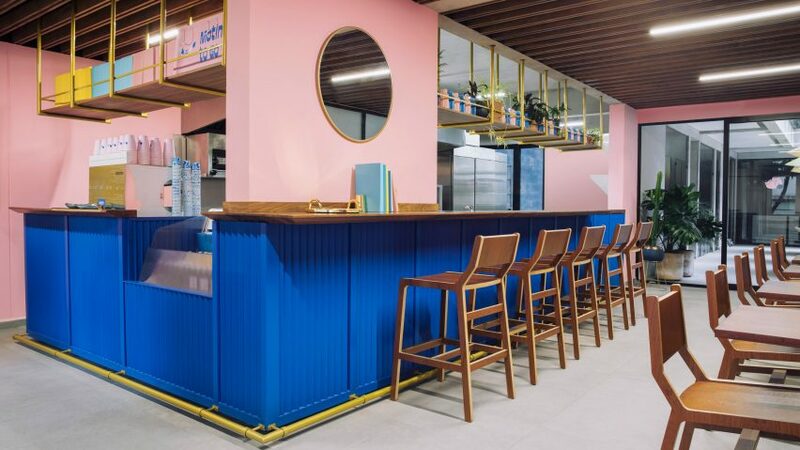 Creative agency Futura has decorated a cafe in Mexico City using cobalt and pink surfaces, and designed playful branding to match. Motín is a brightly coloured cafe in the Mexican capital's Colonia Roma – a trendy neighbourhood known for its culinary and art scenes. Local studio Futura designed the interiors, branding and packaging for Motín, plus a logo with "a cute gluttonous hamster trying to steal your lunch". "For the name Motín, we made a play on words, all related to food, breakfast and gluttony," Futura told Dezeen. "Matin means morning in French, botín means loot in Spanish – thinking again about our hamster stealing your food and keeping it in its huge cheeks – and motín is riot in Spanish." 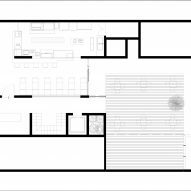 The floor plan of the space is rectangular and measures 75 square metres. A walled-in volume features a front counter and kitchen, which is coloured blue on the bottom and pink above. "We wanted to create a space that felt cosy but full of colour at the same time, a space that you would immediately want to share on Instagram," said the studio. "Our goal was to design a place that was completely eye-candy." 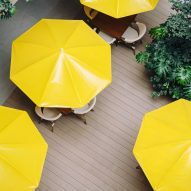 Another cafe with this colour scheme, the Breadway bakery in Ukraine, was recently completed by designers Lera Brumina and Artem Trigubchak. Local studio Solvar executed the interior design and created the furniture for Motín. 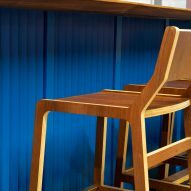 The coffee shop is populated with dark wood chairs made from Triplay of Tzalam – a board made of plywood, and bonded and pressed veneer – via CNC cutting. High-top counters around the perimeter save space, while a garden in the rear has additional seating. Dark wood beams overhead contrast with grey porcelain tiles on the floor, adding natural materiality to the colourful eatery. 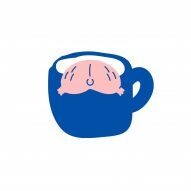 Custom packaging for the cafe includes pale pink take-away cups, smaller blue receptacles, ceramic white mugs with the letter M, and colourful doggy bags. Motín is the sister project of Quesería de Mí, a cafe located in Mexico City's Colonia Condesa. The capital has a huge coffee culture, and among the other design-focussed spots to get a caffeine fix is Tierra Garat by Esrawe Studio and Cadena y Associados. Photography is by Rodrigo Chapa.